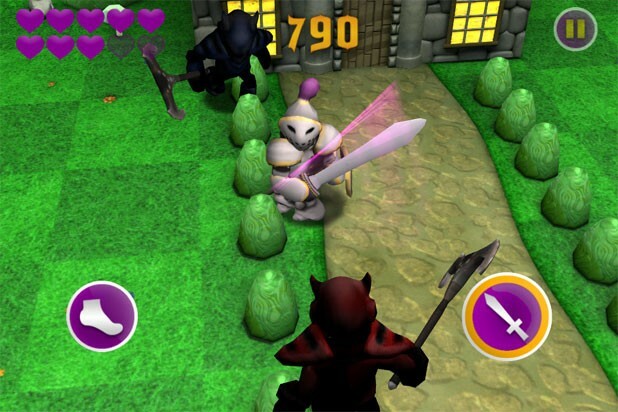 Epic Knights, produced by Burlington’s Toonuva Games, is a third-person action game available free on the Apple App Store. While the game boasts an entertaining soundtrack, and some interesting facts about the St. Michael’s College campus, the gameplay becomes a tedious grind through a multitude of boring levels. Visually, the game looks better on the smaller iPhone and iPod screens. The graphics are passable, with each level representing the St. Mike’s campus in a different season of the year. An iPad version of the game has not yet been developed. The enemies also provide very little variation, with just a few different models to attack. Every so often, attacking activates a special bonus, such as a whirlwind attack or extra damage, but these bonuses are not particularly satisfying. As you play Epic Knights, you earn points, but I was hard pressed to continue playing for very long, and the points seem meaningless, aside from leaderboards. Every level is currently available at the start, leaving nothing to unlock. Each round continues until the enemies overcome you, which, on average, took three to five minutes. If you do keep playing, the game features online leaderboards, seven levels, a quite enjoyable soundtrack, four achievements and an interesting fact about each section of campus. Toonuva project manager Dan Moore says the company created the game to serve as an educational and marketing tool for St. Mike’s. He has promised that future updates will include more content, such as extra character models. For now, since Epic Knights is free, there’s no reason not to give it a try, and, with updates set to release in the next few weeks, the game could see significant improvement. However, I find it hard to recommend when more exciting games, such as Dungeon Hunter 3, are available free, too. Available free at the App Store for iPhone and iPod Touch.